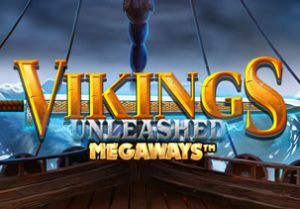 Take to the high seas in Vikings Unleashed MegaWays, a Norse-themed slot game from Blueprint Gaming. This superbly designed game is played using Big Time Gaming’s MegaWays game engine and comes with cascading reels, mystery transforming symbols and free spins with expanding multipliers. Play on all devices from between 20p and £10 per spin. You won’t see many better looking and sounding slot games than Vikings Unleashed MegaWays - the setting is a Viking longship. The wooden reels include A to 9 royal symbols plus 4 members of the crew. The best of the quartet is the blonde-haired warrior who will get you 2, 5, 10, 25 or 50 times your stake if you land 2, 3, 4, 5 or 6 on adjacent reels. There’s also a wild that replaces everything bar the scatter and mystery symbols. The number of symbols on each reel changes with each spin. At their maximum they can offer 117,649 ways to win. After every winning spin, a reaction takes place. The successful symbols are removed and new ones drop in and replace them. These continue until there’s a reaction where no new winner is created. There are 2 other extras on offer on Vikings Unleashed MegaWays. Mystery Symbol feature - all instances of the hammer symbol that land are all transformed into the same matching symbol. A new payout consideration then follows. Battle of the Seas Free Spins feature - land 4 or more scatters on the same spin and you’ll be awarded 12 free spins. Each extra scatter that lands on that triggering spin adds another 5 free spins to your total. The reaction wins are in play during the free spins. Each time 1 lands, it increases a multiplier by 1x. Before the feature, you’ll be offered the chance to spin a gamble wheel via the Gamble feature. This can increase the number of free spins on offer and/or the starting multiplier. If you lose the gamble, the feature ends. Re-triggers are possible during the free spins round too. Landing 3 or 4 scatters adds another 5 or 10 free spins to your total – there are no limits either. The Mystery Symbol feature is in play during the free spins round too for even bigger wins. If you don’t want to wait for the scatters to work their magic, you can also buy the feature – this is called the Free Spins Unleashed Bet feature. It will set you back 25, 50, 75 or 100 times your total stake to trigger 5, 8, 10 or 12 free spins. We really liked Vikings Unleashed MegaWays. The cartoon style visuals are superbly drawn, the animations are silky smooth despite all the moving parts and there’s a stirring orchestral score playing in the background. The gameplay matches the design too. The cascading reels deliver plenty of possibilities but it’s the free spins where things can really start to motor thanks to the expanding multipliers. We managed to turn a 20p spin into over £148 free spins haul after getting the multipliers up to 15x. Both the MegaWays game engine and the Viking theme have proved hugely popular this year. Putting them together in Vikings Unleashed MegaWays has been a great move by Blueprint Gaming. This is one of the best slot games we’ve played in a while. If you like the theme, Net Entertainment’s Vikings and ELK Studios’ Valkyrie should be played.